We're getting a lot of questions about the situation in Decorah. What happened to Dad? Will Mom abandon the eaglets? Did the unknown male eagle attack Dad or drive him away? Are the eaglets being fed? Is Mom feeding herself? We put together a timeline and answers to the most asked questions. Keep in mind that, while researchers have studied bald eagles for years, this level of observation became possible only very recently and there is much that we are seeing for the first time. 4/18/18: A serious snowstorm follows right on the heels of a three-day weekend storm. Mom and Dad spend the day caring for the eaglets, at times feeding and brooding them together in the nest. Dad is last seen on the nest around 7:30 PM. Mom broods overnight. We have been reviewing the footage to look and listen for anything unusual, but the process is time-consuming. We will let everyone know if we do. 4/19/18: A bright, sunny day follows the storm. We are a little concerned when Dad doesn't replace Mom for his morning shift, but think that he might be resting up from the intense flurry of activity following two large storms. As the day wears on without Dad, we become more concerned and begin making plans to go look for him. We see another eagle. Is that Dad? We send an on-the-ground observer, who tells us that Dad is there. However, Dad doesn't show up to feed the eaglets or give Mom a break. 4/20/18: We enter a second day without Dad. We are increasingly worried that something has gone wrong. Mom continues to care for the eaglets, who are stuffed to the point of bursting with nestovers and fresh-caught fish. However, she clearly knows that Dad is gone and at times seems very wary about activity near the nest. She peal calls throughout the day with no response. Our camera operators catch several glimpses of another eagle in the area. We determine it is a male eagle and designate him UME, or unidentified male eagle. Could that be Dad? If it isn't, why is Mom tolerating him so close to the nest? He spends part of the day perched above it and Mom at one point perches near him. If it is, why isn't he giving Mom a break, bringing in prey, responding to her peal calls, and harassing an osprey that has perched by the pond? Why does she seem so wary of his presence? Unfortunately, UME never comes close enough for a look at his iris, molt pattern, or foot scales. John launches a search of the hatchery and nearby areas with some friends, but doesn't find anything. Despite yesterday's observation, we become increasingly convinced (based on behavior and photographs) that Dad isn't here. After a consultation with our eagle experts, we announce that UME is not Dad. 4/21/18: John coordinates a search from the hatchery. 20 volunteers and a drone team from the Decorah Fire Department look for Dad. They search roadways around the hatchery, the bike trail, the stream, the area around N1, the hatchery grounds, hatchery buildings, and power poles and lines to the east. We don't find any sign of Dad. Meanwhile, Mom continues to feed the eaglets and we see UME fly on to the Skywalk and stay for about five minutes. Mom is agitated by the intrusion and remains wary of UME, although her peal calling has largely stopped. 4/22/18: Dad is still absent, another search doesn't turn up anything, and Mom is still wary of UME (who is still hanging around and does a fly through at one point). She feeds the eaglets throughout the day. While we worry, they have bulging crops and are developing on track: eating, sleeping, pooping, bonking, playing house, wingercizing, exploring their clown-clomping feet, and starting to grow pinfeathers. QQ: Could UME have driven Dad away? Or did Dad leave because he was tired of caring or could no longer care for the eaglets after two big storms? We talked with our eagle experts about the likelihood of both questions. It isn't unknown for new eagles to drive away territorial eagles, although we haven't seen displacement during the nesting season at any of our nests. We don't have any documentation of an adult eagle, male or female, simply deserting young, and Dad was caring for the eaglets up until the time he disappeared. Put simply, we don't believe that Dad voluntarily deserted the nest but we don't know where he is or whether UME had anything to do with his disappearance. After several days of terrible migration weather, birds finally got a break and were busy heading north. UME could have displaced Dad, or he may have been migrating through the area when Dad disappeared. Since there was no response to his tentative exploration of the area around the nest, he might have decided to stay and get a little closer. QQ: What could have happened to Dad? Our search was structured along the following possibilities: UME injured Dad in a fight (we searched around the nest with binoculars and checked the trail, stream, fields, and area around N1). Dad was hit by a car while eating or getting roadkill (we searched roadways and ditches). Dad was electrocuted on or collided with a powerline (we searched the base of poles and along powerlines). Dad got caught in a building (we searched hatchery buildings). We covered a lot of area with 20 volunteers and a Decorah Fire Department drone, but didn't find Dad. We still don't know what happened to him. QQ: Is UME a threat to the eaglets? This is a tough question. Anecdotes and scientific literature both contain examples of new adults killing eaglets and caring for eaglets. We are hopeful that he won't, given that he hasn't behaved in an aggressive way towards the eaglets or Mom. We're waiting to see if he brings Mom any food or courts her. QQ: Are you going to pull the eaglets from the nest? We are not. From a human perspective, we would be caring for the eaglets by keeping them safe from hunger and predators. But from Mom's perspective, we would be invading and killing her eaglets. Mom is far more capable of caring for her eaglets than we are, and we have no plans to take her young from her. 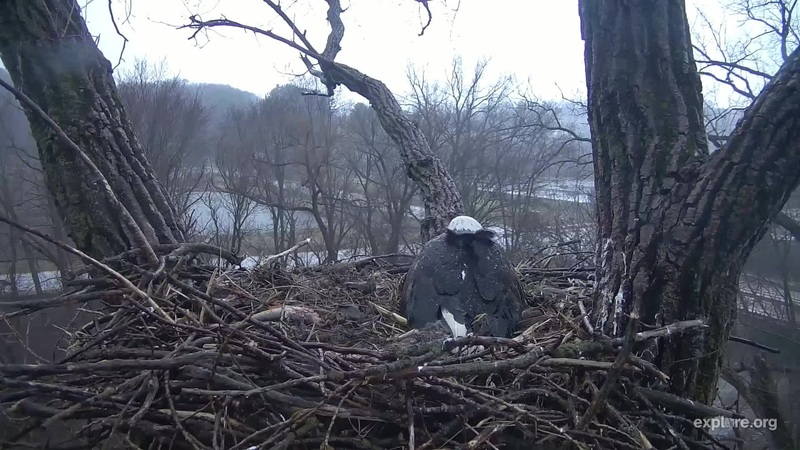 QQ: So Mom can feed the eaglets by herself? Mom has fed the eaglets to bursting multiple times every day since Dad disappeared. Between the hatchery and the stream, she is more than capable of keeping them fed. QQ: I saw that Mom was attacked by a bird. Was that an eagle? Mom was being swooped by crows earlier today. We've also seen starlings and nuthatches steal nesting material and search for food. All of this is completely normal behavior and has nothing to do with Dad being gone. QQ: Mom seems really wary and watchful. Why? Mom is probably responding to UME, who as of this post on April 23rd was still in the area. While he hasn't treated her aggressively, he still isn't her mate and she is usually very wary when he comes near the nest. We've only seen one exception, which happened on Friday, April 20, when she perched near him. QQ: Could this be Mom and Dad's offspring from another year? While it could be, we have no way of knowing one way or another. QQ: How old was Dad? We don't know, but believe him to be at least 21 years old based on his plumage and when we first started watching him.. Is it possible that he could have been less cold-tolerant because of age? We're asking our team on that, but we don't know at this point. Thank you for all of your care and kind comments. We know this is hard on everyone. We promise to keep you all posted. It is April 13 as I write this, and our eaglets are growing rapidly! In Decorah, D29 is twelve days old, D30 is eleven days old, and D31 is nine days old. 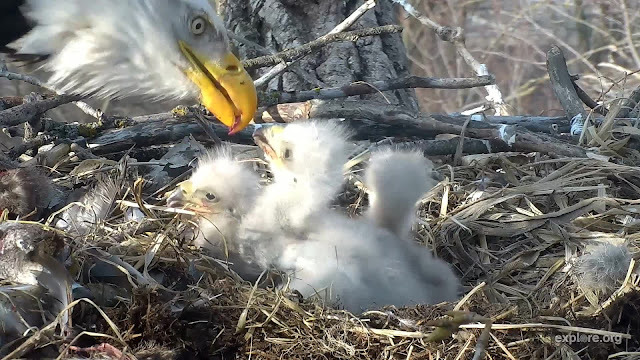 In their second week of development, the eaglets will gain roughly two pounds between their 7th and 14th day of life. They will experience rapid growth in features like beaks, culmens, and footpads, start replacing their white natal down with thicker grey thermal down, and begin exploring the nest. Although they aren't yet standing on their toes, they are able to sit up - way up! - for feeding and shuffle around on their metatarsi. Their eyes are wide open and fit more comfortably in their eyesockets, features like brow ridges are beginning to appear, and their legs and footpads are yellow, not pink. Gary Bortolotti wrote that bald eagles might gain more weight per day than any other north American bird, although the majority of their weight gain occurs within the first 30-40 days. This rapid weight growth is fueled by their nutrient-rich diet of meat. Over the past week or so, we watched the eaglets chow down on fish, rabbit, squirrel, ground squirrel, coot, groundhog, and unidentified birds. D29 became proficient enough at shooting poop to christen the Poopcasso tree on April 9th, although it was quickly joined by its siblings on April 11th and 12th. While babylet battling hasn't entirely subsided, it has become less intense as pecking orders are established and eaglet crops are repeatedly stuffed until they look ready to burst! The eaglets are alternately hitting, submitting, and quitting to cuddle in the nest cup, grow, and wait for more food to arrive. We haven't gotten to see much of them given the cold, but D29 did finally escape the nest cup during warmer weather Wednesday! So what did we see in the nest this week? April 8: Eaglet explorers. Despite the cold weather, the eaglets are busy popping out from under Mom and Dad and starting to nibble at nest materials, exploring the world with their sensitive beaks and tongues. April 9: Preening! When birds preen, they remove dust, dirt and parasites from their feathers and align each feather in its optimum position. D29's exploratory downy nibbles today marked an important first step on the road to feather care! April 10: Thermal down begins to emerge! A hatchling eaglet's fuzzy white natal down doesn't assist thermoregulation, aka controlling one's temperature. Denser thermal down provides more insulation and helps nestling eaglets keep their body temperatures at a relatively constant 105'ish degrees. April 11: Eaglet escapee! D29 took its first sojourn out of the egg cup today! At ten days of age, D29 weighs between about 2 and 2.5 pounds. It can't stand on its feet, but it can sit upfor feeding and shuffle around on its metatarsi. Its feet and toes are yellow, but its tiny talons are still clear. April 12: Cropzillas! D29 has just gorged itself on more food than it can stomach! It will store the food in its crop until it is ready to transfer it to its stomach for digestion. This mini 'pantry' helps assure that the rapidly growing eaglets get the nutrients and calories they need, when they need them. Painting the Poopcasso tree! On the morning of April 9th, the eaglets weren't quite shooting poop as far as the Poopcasso tree. D29 christened it that day, and all of the eaglets were hitting it by the 13th! In the week to come, we can expect (continued) rapid growth in footpads, talons, and legs. Beak growth will rapidly slow as the eaglets' beaks approach adult size and we may see dark juvenile feathers start to sprout from their grey down. Overall weight and height gain will continue, most likely reaching their steepest curves some time this week. By the end of their second week of life, our little bobbleheads at Decorah will be almost a foot tall! Enjoy eaglet earholes and egg teeth while you still can - their earholes will soon be covered by down and their egg teeth are wearing away. Stage 1 - Structural growth. In their first thirty-five to forty days of life, eagles grow very rapidly, gaining weight and building bones, muscles, tissue, and features like tarsi, footpads, toes, and claws. This phase of development slows down about halfway through an eaglet's time in the nest, even though individual features might continue some level of growth. Stage 2 - Feather and flight-related growth. Eagles grow four sets of feathers - natal down inside the egg, thermal down, juvenile feathers, and adult feathers. Thermal down starts growing at about ten days, juvenile deck feathers at about 20-23 days and juvenile flight feathers at about 27 days, but feather growth doesn't overtake structural growth until thirty-five to forty days after hatch. Flight muscles also begin growing as eaglets wingercize, flap, hover, and eventually branch and fledge. Neurological coordination occurs throughout an eaglet's time in the nest. During week two, their eyesight and basic coordination skills are improving as they grab food from Mom and Dad, sit up tall for feedings, shuffle around on their tarsi, and explore the world with their sensitive beaks. As they grow, they will become more adept at controlling beaks, legs, wings, and feet. They will learn to stand on their own feet, tear food, self-feed, and flap their wings, going from cute but clumsy clown clompers to graceful young eaglets poised at the edge of fledge. I'm not sure how familiar many of you are with the cortical homunculus, an image-based tool that maps tactility. While useful and extremely cool, most cortical homunculii are static - that is, they reflect just one phase (usually adult) of an organism's life. But an eaglet's cortical homunculus will differ from an adult's as body parts and associated skills are gained and neural pathways developed. Our eaglets' brains and bodies are rapidly growing and changing as they gain the skills they need for life outside the egg! I'd tend to think that visual acuity and eaglet beak and tongue sensitivity suddenly 'lit up' this week, leading changes in coordination as the eaglets began sitting up, grabbing food, moving around, and preening and nibbling at things. Input from Bob Anderson, who imparted much wisdom and information before he passed. RRP moderators and their calendars, lists, books, charts, and personal observations. Bald eagle tongues and beaks! 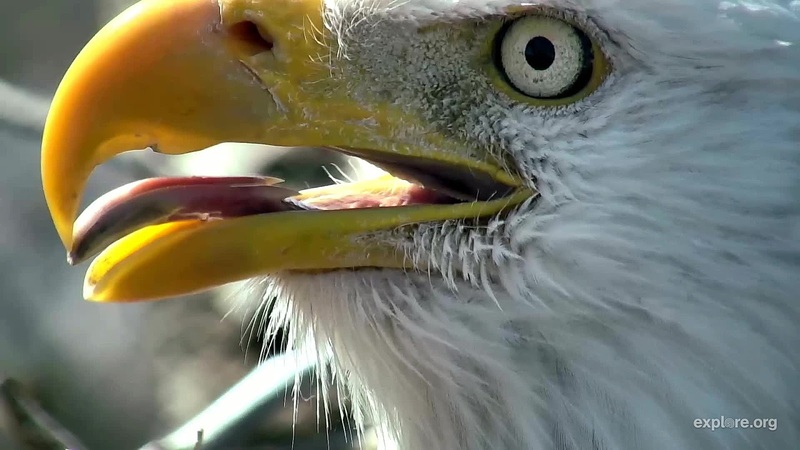 This blog was inspired by RRP Director John Howe, who was reviewing footage of Mom and Dad feeding eaglets and was delighted by the dexterity of their beaks and tongues. I had never blogged about that topic and it was very fun to learn about just how specialized some beaks and tongues are! We know that bird beaks are specialized for feeding and daily tasks. Birds of prey have strong, curved beaks with sharp edges to help them tear meat. Falcons specialize even further, adding a tomial tooth to help them kill prey. Dabbling ducks have tiny, comb-like structures on their beaks to strain small animals, insects and plants from water and mud, while piscivorous ducks have saw-like structures to help them hold on to struggling fish. But what about bird tongues or, more specifically, bald eagle tongues? Are they specialized as well? Let's start by taking a look at Mom and Dad's tongues! 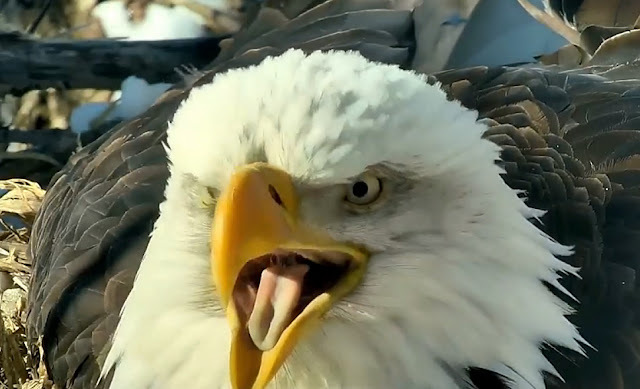 At first glance, bald eagle tongues look somewhat similar to ours. They are pinkish, relatively narrow, fit nicely between the sharp ridges of their beaks, and are flexible. They are short enough that eagles can't easily bite their tongues, although they can stick them out. Unlike us, bald eagles have two barbs, or rear-directed papillae, to help lift and pull food items to the back of their long mouths: a relatively common feature in bird tongues. Although birds of prey don't have specialized tongues, their tongues (and beaks) are packed with mechanoreceptors that respond to pressure, distortion (think of an eagle stretching its tongue or biting into bone), temperature, texture, and vibration. Merkel cells are sensitive to very fine changes in touch, pressure, and temperature. These tonic cells keep providing information to tell Mom and Dad exactly where their beaks and tongues are and what they are doing. Phasic Herbst and Ruffini cells sound an alarm to let Mom and Dad know that something has just happened. Herbst cells are sensitive to vibration, pressure changes (I grabbed or dropped an object), and texture changes. Ruffini cells are sensitive to stretching, distortion, and temperature (I just bumped something warm and hard like an eaglet's beak and mouth). Bald eagles have considerably different diets and lifestyles than quail, but both ducks and quail concentrate sensors in the cranial areas of their beaks (think of a falcon's tomial tooth or Mom and Dad's tomial ridge). Once a bird has allowed something past the tip of its beak, it has a lot of decisions to make about how to respond to it and what to do with it. Given that quail and ducks are preccocial omnivores and bald eagles are altricial carnivores, I would love to see a study on bald eagle beaks. Thanks to their beak blinders, bald eagles have a blind spot directly in front of them, which means they can't always see their young during feeding. So how do they select food, find the eaglets, and get food into their mouths? Immediate and ongoing sensory feedback helps parents and young align beaks, and tells new hatchlings to open their mouths wide for food delivery! Once both beaks are in the correct position, Mom or Dad use their sensitive, flexible tongues to carefully push food into the eaglet's waiting mouth. Changes in pressure, temperature, and texture help the eagles change course in mid-delivery, detect dropped food, find eaglets, and pull back as needed. Mom and Dad also use their tongues and beaks to detect and avoid feeding young hatchlings chunks of bone, large pieces of fur, or sharp fins that could cause them to choke. How do Mom and Dad manipulate food so well? Check out the top photo, which shows a side view of Dad's tongue. We can clearly see that its fleshy tip rests on a muscular stalk. As described in Laura Erickson's excellent blog on bird tongues, this stalk controls Dad's tongue to manipulate food items. Dad can stretch and tip his tongue forward to feed eaglets, pull and tip it backwards to move food into his mouth, or move his tongue to one side or another as needed. His flexible two-stage tongue and rear-directed papillae give him incredible control, and the sensory cells packed into the tip of his beak and tongue provide the feedback he needs to feed eaglets...even when he can't quite see where they are. Annoyed with Mom or Dad over dropped food or missed beak-loading opportunities? Imagine trying to feed eaglets using your just tongue and nose! The video below shows just how delicate they are when it comes to feeding hatchlings. Bird banders can use the color of a bird's mouth and tongue to help age birds. Younger birds may have spots or bands to help parents with food targeting. Colored tongues in some adult birds can aid mating displays and/or signal a warning to other birds. Understanding a species' behavior and diet helps us understand how its tongue and mouth evolved. Check out Laura Erickson's blog More About Bird Tongues Than A Normal Person Would Want To Know for a great look and description of some bird tongues! You know you want to learn more! I already linked to this, but Laura Erickson's blog on the topic is very good: http://blog.lauraerickson.com/2014/12/more-about-bird-tongues-than-normal.html. Through a Bird’s Eye – Exploring Avian Sensory Perception: https://bit.ly/2JydcIq.